My calfs were too tight - not to mention painful - to race tonight. 18:30? If I'd really pushed I would have been lucky to break 20 minutes and I would have probably torn something - not my shorts you fool, I was thinking more calf muscles. So I decided to run it as a recovery jog instead - hopefully allowing me to train tomorrow at the track but we will have to see how things feel in the morning. I ran 23 minutes dead - a new mile stone in my running development and one that I am especially proud of - my slowest ever official 5k race time - have some. Anyway, I actually quite enjoyed taking it extremely easy. I set off dead last but worked my way through the field a tad. At the 2k point I caught up to Harry C, who was just moving off the front of a small group. I could see he would move into no-mans land so dropped just in front to pace him along. He beat his last month's time and broke 23, so I was pleased to help. The tinger on my cooker has just gone off (to where I do not know) so I'm off for my tea - luvly jubbly. The legs are stiff, my heel is bruised and my back aches - but apart from that I'm as fit as a fiddle! - how can a fiddle be fit? I'm pretty sure I will be running the Bridge Inn 5k tomorrow night. Things are feeling easier this evening. I don't think I'll be running a record time though - heck, I haven't run quick there for ages - no change there then. I'll aim for about 18:30 but all depends how I feel tomorrow. Thought for the day: 99 percent of solicitors give the rest a bad name. I had a good run today in the Seaview 17 (which is actually 20 miles but extended to 21 this year on account of a land slide on the path with alternative route in place and takes in about 4,500ft of ascent). It was hard work and certainly pretty hilly. It was just a shame I couldn't capitalise on my lead - yes, I did say lead!!!! - just after the half way point. It all came down to the old 'go the wrong way three times' routine. I suffered with cramp in the last mile and a half and got overtaken - had I not kept going wrong and having to back track I would probably have had enough of a lead to hold on but that's all part and parcel of the off road scene - you win some you lose some. Just a shame it was a day to lose some but Martin, from Nailsea, was a nice chap so I'm happy for him. We had a bit of a chat on the way round and swapped the lead a few times between us. He even offered to slow so we could cross the line together but by that time my calves had had it so I told him to push on and take it, he worked hard to get back to me so fair play. If you had said before the race I could have second I would have bitten your arm off so I have to be happy. It still makes it my best ever finish position in a long distance race - and second is still pretty good, isn't it? Dave T turned up and ran - I have to say I was a bit worried for him because it's way longer than anything he's done of late - well, when I say late I mean years (and years) but he was smiling at the finish so I think he enjoyed it - if it is actually possible to enjoy a 21 mile slog along the coastal path that is! (There might have been another reason for him smiling but I don't know what that could be). I hope he's recovered by Tuesday for the Bridge Inn 5k - can't be using today as excuse. Thought for the day: Why the hell do we do it? Today is a rest day ahead of tomorrow's race. I've mapped out the route from the paper instructions and uploaded to the forerunner. There looks to be a good few places for going the wrong way - which is somewhat a speciality of mine. I'm pretty good with directions and always get to where I'm going - it's just that sometimes I don't take the same route as everybody else! 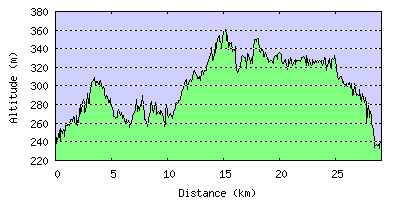 The course looks to take in somewhere in the region of 4,000ft of climb so it's going to be a reasonably hard race. I'm still confident of a good finish though. The only other thing to say is that I shall be taking a look at the finish to the race - don't want a repeat of the Llanbedr to Blaenafon race! Thought for the day: It is impossible to defeat an ignorant man in argument. I managed to get out for the mile reps tonight but they weren't quite as good as I was hoping for. In fact, I am a tad disappointed. I think that maybe a one minute recovery is a might too ambitious for me. Anyway, I hit the first one in 5:50 which was really upsetting - until that is, I looked at the distance and realised that my one mile loop is actually a long measure by about 40m. Then came the one minute recovery in which time I hadn't really recovered at all and was still wheezing like an asthmatic donkey when I set off on mile number two. 5 minutes and 52s later I finished the lap and it hurt like hell. Still determined to stick to the one minute recovery I desperately tried to get my breath back but to no avail as I ploughed on into mile three. This was the killer lap and my legs just would not go. It was like running through treacle for almost the entire lap which took over six minutes, 6:05 to be precise. I decided to call it a day. It wasn't the four laps I was aiming for but to go on would have been futile. I shall put tonight down as a learning experience - a one minute recovery is just not enough you damn fool. I reckon that 5:50 is a realistic target pace but on the back of two minute recoveries. I shall try again next week but with that longer recovery - and I WILL make all four at 5:50. Thought for the day: One minute - that ain't no recovery you fool. 'Torpid' haven't used that word - well, ever! Go look it up. All day I had been planning to run mile reps. I headed to the gym after work and hit my highest ever score on the fit-test setting on the bike, 52.7 beating my previous 51.9 which gives me another boost - not that I'm needing any at the moment. I then hit the weights and subsequently ache all over - I was still feeling Tuesday's weights session before I started and tonight's workout has just compounded the damage. Thought for the day: The pen is mightier than the sword, and considerably easier to write with. It was a case of very nearly the old Wednesday magic and the group was massive tonight, there were seven - yes, that's SEVEN!!! Nick and Sean ran Rick's punishing 500m/300m reps with just 20s recovery between the five and three - glad I was excused that one thank you very much! The rest of us, Harry, Jamie (new a few weeks back while I was away), Rob, Matt and not forgetting me of course, ran 3 sets of three 300's with 1 minute recoveries. I found it tough going after the relatively easy two weeks I've had :) I managed fairly consistent reps though and overall it was a good session. My splits were 49, 52, 49 then 49, 50, 50 and finally 48, 50, 52. I found the last couple really hard but found myself having to dig deep after just the second 300. It was a tough battle tonight both mentally and physically. Luckily I managed to stay with it - although some might beg to differ. Long may the group remain at seven - the magic number - seven of us, in the seventh month, in the seventh year of 2000 - nice. Thought for the day: What's the difference between ignorance and apathy? I don't know, and I couldn't care less. It was just an easy hour today. Nothing special, just an easy trot around the block. The group was a little smaller than the last few times I was out with them but there was one or two new faces so hopefully the group will expand again. I like the gym run because it allows my to strut my stuff and look impressive - only joking (although I do look impressive) - seriously though, it forces me to run within myself and take it easy, it breaks up the 'every run is a hard run' routine - which I can be a little prone to. I feel totally ready for the track tomorrow. I have no reason not to run fast - if I don't then I will have to beat myself with a sharp stick, I have been warned. Though for the day: Better to understand a little than to misunderstand a lot. I decided to go for a burn up tonight - only short distance mind you but a burn up never-the-less. I set myself a time trial on a route that a few of us used to do on a Wednesday night. It's about 7.5k, a bit up and down and more to the point I've never broken 30 minutes - my previous best being 30:32 - oops see what I did there, 'previous best', I think I might have given the game away - but who cares it's not like this is Harry Potter and the Tasty Marshmallows. It rained a bit tonight, making the corners slippy but I piled it on from the start. It's so long since I've done the route that I couldn't remember any of the route timings so just had to keep my foot down. My previous best was set with the aid of pace makers but it's way harder to focus when you're out there solo. Anyway, I just kept pushing, pushing. Eventually completing the course in 28:52 - 1:40 quicker than I've gone before and most importantly breaking the 30 minute barrier - all in all a terrific time trial triumph. Tomorrow will be an easy run with the gym crew. Thought for the day: Who cares if it rains - it's only water. Especially when I can get up to Ashton Court for my good old Sunday run. The group has shrunk since my last run but I'm sure it's just a temporary thing - we did have a new boy though, Jerry H - and it looked like he could run! It didn't rain and was really pretty decent running conditions - a bit soggy underfoot perhaps - but it seems like I've brought the decent weather back down with me. We did one of our standard routes through Leigh Woods and along the tow path. I put my foot to the accelerator on the last climb back into Ashton Court (round the edge of the deer park on the right from the bottom entrance) - well I guess it was more of a case of trying to push on the hill rather than the accelerator but I went up well - stop it - really strongly - much better than of recent times - all helps to keep the confidence high. 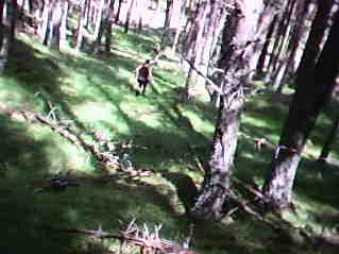 And I know you're all desperate to see Episode 14: North Of The Border, so here it is in all its techni-wobble glory. PS, 5th place - back of the net. Well I managed to get out for that one final run before heading home tomorrow. True, it was only a short, flat one, weighing in at just over 18 miles and 3,000ft of ascent but it was a bit more pacey than previous, averaging towards my target marathon pace and it included navigating gates and styles etc. All in all it was a good session to end with. Always good to end on a high note. I have to admit that it's been a hard couple of weeks on the legs which have held up admirably under the strain. My weekly mileage is up by over 66% which is quite a jump but nothing has broken - so far. The foundations are well and truly laid and I really feel the old strength is back. I'm now confident going forward towards Berlin. This has given me a much needed boost and Sunday's race was a superb added bonus. Looking to the week ahead I think it's time for an easier one - although I will definitely be there on Wednesday for the track. Ultimately the hard work starts here and in the ensuing eleven weeks until Berlin I am going to build on what I have achieved over these last two weeks. Thought for the day: Only borrow money from pessimists, they don't expect to get it back. I couldn't be bothered to get out for a run today. Played golf though and, even though I say so myself, I played some of my best golf of the entire holiday. I was pinging the ball down the fairway. Really struck the ball well today and didn't really hit any shot off line. Even managed play with the same ball for the entire round as testament to that fact. I could feel yesterday's run in my legs as I walked the course - and those couple of 65's run on my behalf - eh, lads. I'm looking forward to coming home now. It's been a good break but I feel more tired now than before we arrived. Training wise it has been excellent. The number of tough, long runs I've put in has been great. I'm intending to run one final medium distance session tomorrow of maybe, 17 or 18 miles before we head back on Saturday. Thought for the day: I love cooking with wine. Sometimes I even put it in the food! The weather was fair today with the exception of low cloud. For a good distance of today's run I had my head in the clouds - shut it - really, I was up in the clouds - and it was pretty damn cold - especially when only wearing shorts and a t-shirt. By the time I headed down off the mountain my freezing hands were unable to operate my shoe laces when they came undone. Once down off the mountain for the final 10k stretch I soon warmed up. I was pleased with the run but again it was more of a hike really. The conditions and terrain for about 1/3rd of the distance was just totally unrunnable. Visibility was down to about 50 metres on top so I was damn glad I had the route programmed in on the forerunner or else I would have been in trouble. There is no discernible route across the mountain so I had to totally rely on the programmed route. On the whole it was pretty good - apart from one vertical drop that I had to navigate around. And as an added bonus my gladiator fell shoes are gleaming after all the crystal clear (read cold) rivers and streams I had to run through! It was another really energy sapping run but I ran pretty strong in the last 10k which took me way beyond the 'wall'. 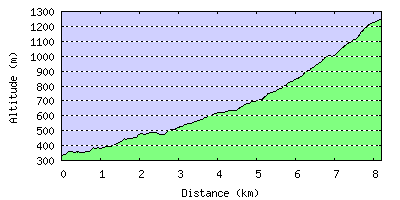 The total distance covered was around 25 miles and 7,500ft of climb. I'm pleased I put yesterday's poor effort behind me with a good, strong showing today. My legs are scratched to pieces from all the broom I had to climb over and my heels are bruised big style from all the pebbles and stones I had to run over - I hope they feel better tomorrow because they're sure as hell painful tonight. Tomorrow is another rest day - aka a golf day - although I may try and fit in a short 30 minute recovery run then hopefully I can fit in one final long run on Friday. Thought for the day: Nobody cares if you can't dance well. Just get up and dance. Well that did the trick - took my mind off the bad run. It chucked it down out there on the golf course. We got soaked and then it started to thunder so we headed in. It was quite refreshing really. I played total pants but it cheered me up big time. Feel tons better now - all set for my long one - stop it - my long run tomorrow, and we're talking 20+ miles. Today's run to the summit did not go well. The weather was great. There were a few too many flesh eating flies - OK, so they don't actually eat flesh but they're bloody annoying all the same. Overall, conditions were good. It was just a terrible run. From the start I felt tired and my breathing wasn't quite right. I've had the sniffles for the entire holiday but it hasn't affected me until today. Somehow I just wasn't able to breath deeply. Anyway, after about 15 minutes I stopped and started back down but then I felt annoyed with myself so started back up again but after another 5 minutes I stopped again and that was the end of that. There was no way I was going to make it to the top today - at least in any sort of half decent time - so I decided it was better to save myself for tomorrow's long run. It's a shame because there's no other space in the Schedule to fit in another attempt at getting to the top - today was the only window of opportunity and I blew it. I'm not going to be too hard on myself though - to be honest things like this really p@#$ me off so I shall try and do something to take my mind off it - I know I'll go and 'play' some golf - that should do the trick. The rest of the training has gone really well and the race was a great bonus. I'm allowed one off day - I just better not have more than one! Thought for the day: Only the mediocre are at their best all the time. It was the first day of really bad weather that we've had. I was hoping to get back up to the top of the Cairngorms again but it was too nasty today and I'm obviously just a wee softie - one week in Scotland and already I'm getting the hang of the the lingo, not bad eh? I'll be speaking like a native soon - well, maybe not. Anyway, I managed to get myself out for a short 40 minute recovery run, up to Loch Garten and back. To be truthful the legs felt a bit stale. It's amazing how your legs can feel fine with your arse sat on the nice comfy sofa and so crap when you start to move them, one in front of the other, in rapid succession - strange isn't it? OK, so not that strange - and I suppose, not that unexpected. I guess the recovery run was actually a sensible option in the end. Thought for the day: A jury consists of twelve people chosen to decide who has the better lawyer. Today witnessed my continuing return to form as I finished (what I consider to be a very creditable) fifth in the Heart Of The Park Challenge, a 12km (actually 12.8km on the GPS) multi-terrain, fell style race with about 2,000ft of ascent. Unfortunately, the river crossing had to be ommitted on grounds of safety because the river was too high and fast - which was a bit dissappointing because I was looking forward to that part. Anyway, I set off steady in about 15th place for the first kilometre and steadily picked off a few runners during the first of the climbs. Then I zoomed past a few more on the descent to move into about tenth place by kilometre three. The race then entered the settled phase - you know, the point when you reach relative pace with those runners ahead and behind. I then just dug in and started to work towards those ahead of me. 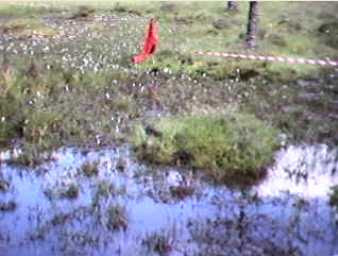 At about kilometre five we hit the 'bog'. 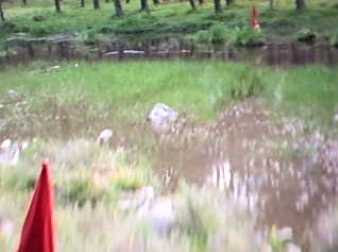 There were five red flags dotted across the watery depths which you had to touch as you went passed - no skipping round the outside permitted - wet pants were the order of the day. 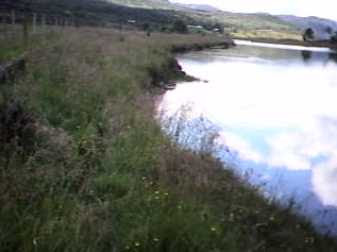 The water came above the knee in places but you just had to plough on through. Gradually I gained on those ahead of me. I made steady gains on the uphills and rapid gains on the downhills. By kilometre ten I was up to fifth place and the outcome was settled. The guy infront was about 250m ahead which was too much to close down. 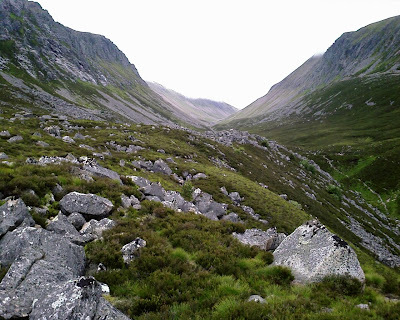 The lie of the land was perfect for me - a narrow, twisty, rocky path alongside the River Dee but the gap was just too much. Although I gained some it was too big an ask. I knew the guy behind was beaten, suffice to say I pulled out a massive gap on him come the end. Thought for the day: If you find yourself in a hole, the first thing to do is stop digging. PS. 'Episode 14: North Of The Border' is in preparation but won't be online until I get home - I need my fast connection to get it uploaded (techy/nerdy stuff you can switch off now if you like). It was another golf day today - the Craggowrie Cup - incidentally one of the mountains I ran up yesterday was called Craggowrie - it shadows the golf course. If it was an omen it wasn't a particularly good one but neither was it that bad. I managed to navigate the course much better than last week and I'm guessing I might just scrape inside the top ten so I'm happy with that. Onto the running. Thought for the day: The height of cleverness is to be able to conceal it. 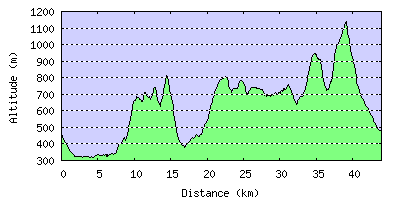 What started out as a 21 miler with 6,000ft of ascent ended up as 27.5 miles with 10,000ft of ascent. It was more of a mountain trek than a run, taking in some extremely un-runnable paths and trails. Suffice to say I am a little bit knackered now - well, if I'm honest, I'm totally shagged but I like to be a bit dishonest and stick with the 'little bit knackered' story. It was a cracking route though. The reason for the extra miles and two extra climbs was because my original route didn't seem to exist! I had the route programmed into the GPS but the stretch called the Strath Nethy pass just didn't seem to be there so I had no choice but to divert up to the top ridge, running parallel to the pass to begin with but obviously much much higher and heading off to the east and south, adding the extra miles and climbs. The amended route also called for two river crossings and boy is that mountain water a tad on the chilly side - just glad it was only knee deep 'cause it would surely have frozen my wotsits off! The highlight of the amended route was passing Loch Etchachan, at a height of about 3,100ft above sea level, in the shadow of the last remaining snow (see web album below) then it was a nasty descent down to Loch Avon at a height of about 2,400ft above sea level. I'm guessing not many people get to see these Lochs as it's quite a hike to get to them. The final ascent was a killer to the route highpoint of 3,750ft, up the side of a cascading stream. It was more climbing than hiking and certainly not running. To be honest I was glad when I had that final ascent out of the way because I was running on empty (I was a naughty boy and didn't take much food and no water, ssh don't tell anyone). The final three miles where hard even though they were downhill. By the end I was just glad to get back to the car. It will be a golf day tomorrow so I can get some rest ahead of the 'Heart Of The Park Challenge', Braemar on Sunday. I have a added a few more pictures from today's and Wednesday's outings to my Scotland Web Album which you can view here. Thought for the day: The surprising thing about young fools is how many survive to become old fools. PS, good to hear there was no slacking from the boyz (thanks Nick, for the update) - I knew they'd come good. ... for the golf to remain good. That's not to say I played too badly but it was much more ordinary today. I did hit a few massive drives but I could never quite take full advantage when I did. Still, it was a long way removed from the rubbish of Saturday so I'm reasonably happy. Giving thought to all things running, it was a track night last night back at home and it feels strange to have missed out. I'm pretty sure Rick was away as well so the lads would have been coachless - hope there was no slacking lads. I should get my intelligence report through any day - just joking - or ..... No, I'm sure they managed something - they're a good bunch - did I really say that? I must be going soft in my old age. The forecast up here is for a cloudy day tomorrow with some fog. I'm hoping to get out into the mountains again so I hope the weather doesn't scupper things. My legs feel almost completely recovered from yesterday's long run which is surprising - I guess it means I'm beginning to reacquaint myself with my old friends, Strength and Stamina - I sure have missed them. 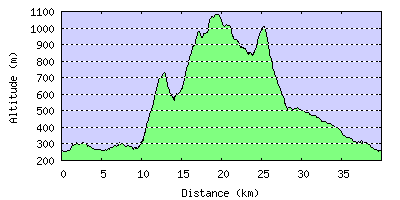 It's going to be a 20 miler taking in four 2,250ft peaks and one 4000ft peak with a total ascent of around 6000ft - I know, I know, that doesn't add up you say but that's because I'll be running across ridges between the peaks and not all the way back down each time. Even so, it's still going to be a cracker. I have a couple of even longer ones planned for next week but I'm keeping them under wraps till then. Thought for the day: No matter what happens, somebody will always find a way to take things too seriously. 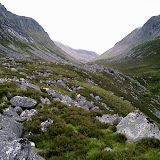 Well I took it right to the very edge of the event horizon - beyond which point there is no return - from the Lairig Ghru. I'm not quite strong enough to venture in so I just peered through from the edge and then banked sharply to the left and headed on home. Even on a day like today when the weather is pretty good, the mountains where still shrowded in mist and low cloud so I definitely need a few more strong, long runs before I go on through - maybe next year. It was a tough run covering just over 27km and about 4200ft of ascent, on pretty uneven, rock strewn tracks and trails. The hardest section came shortly after the turn point, crossing through a mountain pass. There were literally hundreds of boulders to navigate - suffice to say running was near impossible. Some of them had to be climbed over - but I still navigated across them pretty quick and I certainly gave a group of hikers a shock as I moved rapidly past while they dilly dallied! I suspect they thought I was a nutter out in my short sleeved top and shorts while they had full gear, top to toe - but then I am the mad runner! (Safety first, DIY second, I did have some emergency gear with me just in case). All in all it was a good days run. The quads were still a little sore from Monday so I fully expect them to be bad tomorrow so it will inevitably fall to just a golf day. Thought for the day: The problem with the gene pool is that there is no lifeguard. It was another a golf day today - the quads are baaaad from yesterday but I have an eighteen miler planned for tomorrow that will take in another 3000ft of ascent and take me to the very edge of the Lairig Ghru. The golf was much improved. It almost looked like I'd played before! We played an informal four ball better ball - which for the uninitiated is two teams of two players where the best score from each pair of players counts on the hole. Not only was my golf improved but we managed to win. The match went all the way to the last hole before seeing my final putt, from six feet, dropping into the hole to claim a 1 hole victory - have it. Thought for the day: You see, perseverance can pay off. OK, so it was more of a grind to the summit - it was bloody steep come the end. I was just outside the hour (21s outside) which was a bit disappointing - actually it pissed me right off but I won't mention that. It gives me a spur for next week though, when I will definitely break the hour. The throat is a lot better today, still a little sore and the deep breathing didn't help but I suppose all in all it was an acceptable day at the office. As proof of the run here are a few photos from the summit - there's even a bit of snow left over from the winter - brrrrhhh. Thought for the day: Blessed are they who can laugh at themselves for they shall never cease to be amused (I'm sorted then). It was too windy to head up the mountain today so I changed plan. Out went the ten miler and in came the 10k tempo as a late replacement - which turned out to be only 9.8k but I had a good pace going. It's a route I've run many times before - up through the woods to Loch Garten and back in a big loop. I started out slowly at seven minute mileing and steadily picked up the pace towards six twenty's at the end. I've had a sore throat for the last couple of days but I thinks it's easing so I'm pretty sure I will head up the mountain tomorrow irrespective of the wind. Thought for the day: To err is human - and to blame it on a computer is even more so. Now I know I haven't played a round of golf for nine months but bloody hell that was Rubbish with a capital R. The only saving grace was that it didn't rain too much so we didn't get too wet. Other than that I suppose the best that could be said was that it was a reasonably pleasant walk in the country. I can't divulge my score because you might all die laughing. Suffice to say, because I'm not scared, I came last of those that actually managed to get that stupid little white ball around the course - there were eleven players that didn't manage even that - so I didn't really come last in the competition - stop laughing - I SAID STOP LAUGHING. Stupid bloody game. 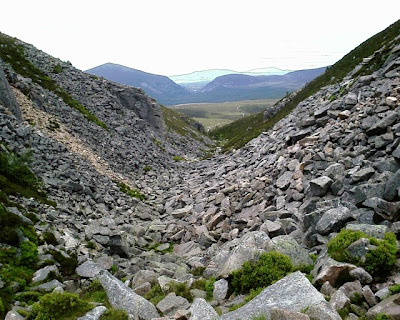 The forecast for tomorrow is reasonable so it will either be a nice steady run of around ten miles or I will attempt the run to the summit of the Cairngorm Mountain - an ascent of around 3100ft in the space of five miles - followed by the five mile return journey. I'm feeling pretty knackered right now. We arrived here at five in the morning after an overnight ten hour drive so I shall be in the land of nod imminently. Thought for the day: The wages of sin are death, but by the time taxes are taken out, it's just sort of a tired feeling. I've carried out the final pre-flight checks. Passport - check, luggage - check, clubs - check, running shoes - check. Yep all ready - which is just as well as we're currently moving steadily on route on the M6 - destination the Cairngorm Mountains. 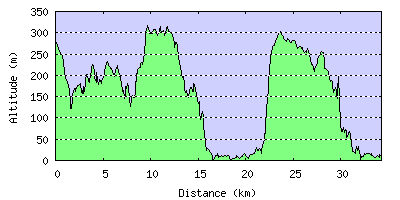 I've even managed to locate a race while I'm up there - some 12k multi-terrain thing out of Braemar a week on Sunday - should be fun. I've even brought cappy along so I might manage to create episode 14 of the Mad Runner. Well I managed to get out for that two hour run and we covered 17 miles in 2:04 - and all before work - now that's sets a new record for me. We started out slowly but were going well by the end. 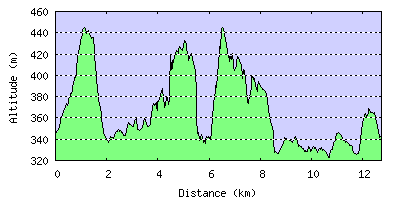 I picked out one of my speciality hilly routes (1850ft) - would I ever pick a flat one for a long run? - I think not. The route took in the delights of the Ashton Plantation, Lower Failand, Leigh Woods and Ashton Court. I think he enjoyed it, we certainly worked off each other. I was struggling with my knackered quads from yesterday for most of the run but got flowing nicely for a few miles. He went well for the most but just began to struggle - well, not exactly struggle, more found it tough going - in the last few miles. It wasn't the quickest I've ever run but with each long run completed my pace is getting quicker and quicker. And once again, the last few miles saw the fastest pace at around seven minute miling. Thought for the day: When choosing between two evils, I always like to try the one I've never tried before. Enough idle chatter, on to tonight's track reps. The only good thing I can say about tonight's session was that at least I stayed the distance and did all five reps. We ran 800's - 600m steady and then picked it up (or tried to) for the last 200m. I was, to say the least, not quick. Without making excuses, the wind was too strong in the home straight - damn, I just made an excuse. On the first lap it was hard effort to stay on pace, the second lap was a lost cause. I did pick up the pace in the final 200m but only by a couple of seconds and I was practically falling over my own feet. My times were 2:35, 2:40, 2:40, 2:42 and 2:44. I was just not fresh enough tonight but I stuck it out. We all found it tough going tonight - Sean and Nick that is. No Harry or the forgotten one - Rob. Thought for the day: There is a fine line between fishing and just standing on the shore like an idiot. - Ooh, no, control yourself. I went out with the gym crew today. We ran up to the downs which gave me the option of adding on an extra loop of ladies mile (about 1.75 miles extra). Unfortunately I could not resist and set off like a scolded cat. It was too much of a challenge to run the extra and try and catch them all back up on the run in (met John D coming across the Suspension Bridge - but didn't have time for a chat). I went too fast - not in terms of the run itself - that was great. I really put in a good 9 mile tempo session but I can feel it in my quads which means I might have wrecked my chances for tomorrow's track session! But on the plus side I managed to catch all but one and I can definitely feel the power continuing to come back. I finished really strong - when I say finished, it was pretty much the last 6 and a half miles and I was really piling it on. I'm going to try with all my might to get up tomorrow morning before work and get out for an easy twenty minute recovery - I so hope I can muster. Thought for the day: Why the hell can't I just control myself - just once would be nice. I was too tired to run today. I took my kit to work but I was just too darned tired. I've now come down from the high of the weekend - oh what a great run I had. I managed to put in a hard hour on the bike and half on the weights so at least I managed something. And the hamstrings are both a lot looser today. I'm going to go for an easy one tomorrow and then hit the track on Wednesday when hopefully I will be fully recharged and ready for action. Easy Runner were at the gym today with video analysis of your gate - oops, gait. I feared they'd tell me I had completely the wrong shoe and run like a spanner but it was actually good news. I have near perfect gait - well, OK they didn't exactly say 'perfect' more it'll do, but they did say I was running in the correct type of shoe - a neutral shoe, which in may case is the Mizuno Wave Rider which I've been with ever since version 7 (now on version 10) and land with a decent mid to fore foot strike - which is nice. At the end of the day though, because I suffer so few injuries (on account of my indestructibility) it pretty much pointed to the fact that I had the right shoe - that's right as in correct not right as in running with two right feet - I'll shut up now. Thought for the day: Anybody can win, unless there happens to be a second entry. Massive congratulations to GWR for their fantastic third place in the Cotswold Way Relay yesterday and well done to Simon for managing to organise twenty runners for their two teams - no mean feat in itself. I was glad (and honoured) to have helped in a small way to their success - I'm only sorry I couldn't have stayed through the day to support the effort but I couldn't refuse the excuse for a booze-up, err, I mean genteel Birthday celebration - my head was not good this morning! The team finished just over ten minutes behind the winners, Team Bath, and under two minutes from second placed Stroud - if only I could have gone just a little quicker..... but honestly, I gave it my all. My quads are really hammered today and as an added bonus I now have a matching pair of tight hamstrings - yes, that's correct, the right one has now dutifully joined the left. Hopefully it will ease off in a day or two. Suffice to say, what with that and the 160 mile drive home this afternoon I'm having a rest day. Normal training should resume tomorrow - no rest for the wicked - well, ok, a little bit of rest but I can't be going all namby pamby. Thought for the day: What's another word for thesaurus?